I love Post-It Tuesday! Why bother spewing verbal vomit when you can sum it all up in one neat little post it note? That's all the definition you need right there! 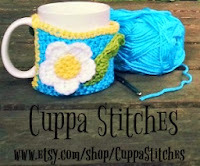 Check out SupahMommy for rules and linkies and join in on the fun! 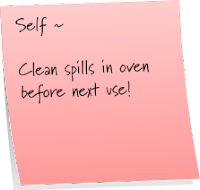 Love your post it notes! OH I Love the spider. I should put a snake in the bed sometime my husband is scared of those. He wants to rake?? How did you teach the little dude that?? Spill those secrets! 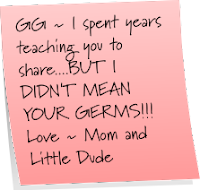 Germs are the only things my kids willingly share. I always forget about cleaning the oven...until I am using it the next time and smoke is coming out of it. Ooops. MY DBD hates spiders.. so i do the same thing. 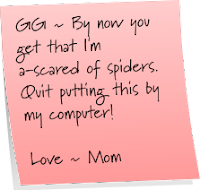 LOL love your post-its this morning - too funny about the spider - the sneaky little thing! HA! My kids try to scare me with plastic snakes. And it works. 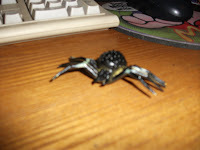 It was just a picture but I thought that apider was REAL...imagine if I had sat down at my computer to find it there...eeeeee gads! I get the tree thing too..grrr, just loose the leaves so I can rake and get it done already! Luckily my little guy did not share his sick germs this week. I so need to clean my oven too. It's just selective hearing with the male species, they say they don't hear but they do!